Will Kyriazis is a graduate of the Lamont School of Music’s jazz and commercial music program at the University of Denver where he received the award for the most outstanding jazz musician of the class of 2013. He continued his education by attending graduate school at the University of Denver in the Morgridge College of Education, where he graduated in 2014 with his Masters in Curriculum and Instruction. Will is a freelance performer and music educator. His prior experience is highlighted and not limited to: Hibbity Dibbity, WILK, and Mama Magnolia. Will toured Western America incessantly with the San Francisco based swamp-funk band, Hibbity Dibbity. He has now relocated to Chicago as faculty at the New Music School and will be releasing his new album, Set Adrift this fall. Ani Gogova’s “dazzling artistic presence”, “masterful poetic expression” and “virtuoso technique beyond reproach” have been captivating audiences around the world for almost two decades. Her career started early in her native Bulgaria when she won all major competitions, including the most prestigious National Music Competition “Svetoslav Obretenov”, Since then Gogova has appeared in solo recitals and concerts with orchestras in Bulgaria, Italy, England, Slovenia, Romania, Portugal, France, Canada, and throughout the US. Her solo renditions have been heard on the Bulgarian National Radio, FM Classic Radio, Interlochen Public Radio, and WFMT Chicago. Cory Tiffin is the principal clarinetist of the Las Vegas Philharmonic and regularly performs with orchestras across the nation. He has appeared as a soloist and chamber artist with the Chicago Chamber Musicians, Fulcrum Point, International Chamber Artists and the Lincoln Trio, among others. As a founding member of the Chicago-based Anaphora Ensemble, Tiffin curated, commissioned and performed a diverse array of works from classical to contemporary to performance art. Tiffin is the Clarinet Instructor at Loyola University and has served on the faculties of DePaul University and the Chicago High School for the Arts. Tiffin can be heard on the Southport and Albany label. Making his solo debut at the age of 10 with the Florida Symphony Orchestra, Yuriy went on to receive numerous prestigious awards including first prizes at the Music Teachers National Association Violin competition, American String Teachers Violin national violin competition, Bach Society Violin competition, and a fellowship grant from the Aspen Music Festival. After graduating from Northwestern University, Yuriy has served as a substitute member of Chicago Symphony Orchestra, and is currently the concertmaster of the local Chicago Arts Orchestra and Northwest Festival Orchestra, and has recorded with the Naxos label. Others have described Shi-An Costello (世 安) as “a tour de force… a thoughtful and adventurous artist” (Boston Musical Intelligencer), “a precise, engaged, welcoming performer unafraid of deep ambiguities” (Chicago Reader), “trailblazing a path truly unique” (Pianoforte Foundation), “completely unique to the Montréal scene and perhaps the world over” (Innovations en Concert), “finds the depth in every note” (composer Philippe Leroux), “comic but faintly chilling… pointillist luminosity” (Chicago Classical Review). In 2009, Steve Yépez founded the Chicago-based chamber ensemble Primavera Players. With a focus on student outreach concerts, Primavera Players is dedicated to exposing young people not only to classical music, but also to history and geography in a dynamic and interactive setting. As a performer, Mr. Yépez has enjoyed playing in groups such as the Lakeshore Symphony Orchestra, Orbert Davis and the Chicago Jazz Philharmonic Orchestra, the Chicago Metropolitan Orchestra and the Lira Ensemble of Chicago. In Los Angeles, he performed with the West Los Angeles Symphony, Burbank Philharmonic and the Beach Cities Symphony Orchestra. For three summers, Mr. Yepez had the opportunity to perform at the Walt Disney Concert Hall in Los Angeles as principal and assistant principal flutist in the Idyllwild Festival Orchestra. Kyle Dickson holds degrees from Michigan State University College of Music and DePaul University. He was a prize-winning laureate at the 2012 NANM National Concerto Competition, the Simon Clements Music Competition (2007), and the James Tatum Foundation for the Arts Scholarship Competition (2008). His solo and chamber music collaborations include appearances at the Arts League of Michigan, WFMT’s Make Music Chicago, Taneycomo Chamber Players, Cello Plus Chamber Music Festival, Ebenezer AME Cultural Series, Lunchtime in Paradise Concert Series Up and Coming, and the Milwood Series. He has given masterclasses at Indiana University-South Bend as first violinist of the Chicago Solisti Quartet and the Naperville School of Performing Arts as a member of Chicago Sinfonietta’s PI Quartet. 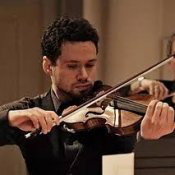 Timothy Hager is a graduate of the Peabody Conservatory (2007) and the Chicago College for the Performing Arts (2009) with degrees in viola performance. He was privileged to work with acclaimed soloists Victoria Chiang and Roger Chase. From 2008-2011 Mr. Hager performed as a full member of the Chicago Civic Orchestra under the direction of Cliff Colnot. Timothy Hager currently enjoys an active freelancing career in Chicago, where he is a member of the Chicago Composer’s Orchestra, the Logan Chamber Players and the Renovo Ensemble. A top prize winner of international competitions, NMS faculty member pianist Jeffrey Panko has been featured in performances at Carnegie Hall, Lincoln Center Library, WFMT and WQXR Radio. By request from the City of Chicago, Panko presented a Chopin recital for the visiting Lech Walesa culminating in two Command Performances for Polish Prime Ministers. Cellist in the Grammy Nominated Lincoln Trio and the recently formed Black Oak Ensemble. Mr. Cunliffe has given master classes across the USA, Europe, and recently in Colombia. Multiple CD releases on Chicago's Cedille label include "Notable Women" and "Turina: Chamber Music for Strings & Piano". Mr. Cunliffe is a member of Chamber Music America and has served on the Advisory Board of 'Music In The Loft', the 'Chinese Fine Arts Society' and the 'Sejong Society'. He currently serves on the board of the Society of American Musicians as Vice President. Aurelien Pederzoli plays violin and viola, and is a member of Chicago’s Black Oak Ensemble. He was a founding member of the Spektral Quartet and the ANAPHORA ensemble. Born in 1982 in Nancy, France, he took up violin at the age of three. At seven, he appeared as soloist with the Philharmonic Orchestra in Nancy. Since then he has performed extensively in Europe and the U.S., including performances at the Verbier Festival, and under conductors Pierre Boulez, Kent Nagano, Daniel Barenboim, Valery Gergiev, Alan Gilbert, and Lorin Maazel. Pederozoli studied with Shmuel Ashkenasi in Chicago, where he now lives. Along with extensive performing, he teaches at the New Music School. Pederzoli plays a 2013 Joseph Curtin violin.